Juraj Huska arrived in Gillingham in the summer of 2013 with a fearsome reputation in front of goal – a reputation built on these shores during a prolific season in the league above with the Telford Tigers and three years with the Romford Raiders in the NIHL South’s top tier. Huska managed 55 points in the EPL with the Tigers when he first arrived from Slovakia in 2006/07 and, though he then went on to France and his home nation for the three campaigns that followed, Romford were able to lure him back to the UK for 2010/11 where he then thrived. The import forward would appear 141 times for the Essex outfit and his contributions were a major factor in steering the Raiders to the summit of the table in 2011/12 – Romford claiming their first championship in over a decade. Three seasons in the blue and gold eventually came to an end last summer but Huska left the Rom Valley Way venue having scored 210 goals, claimed 168 assists and so tallied 378 points for the home side. The Silver Blades would then be his new hunting ground and the Dynamos the team benefiting from him scoring prowess in 2013/14 with the Slovak living up to expectations – finishing as the club’s top goal scorer come the end of the campaign with 57 strikes in 50 outings. 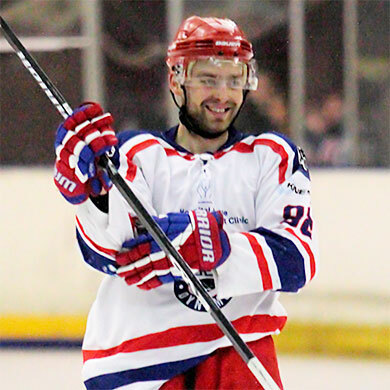 A further 49 assists saw him total 106 points and now the import forward will be looking for more of the same as he prepares to line up in Kent once more when 2014/15 gets underway. “Juraj’s accuracy in front of goal is beyond doubt and his ability to finish is perhaps as good as it gets at this level. He’s the sort of player that draws special attention from opposing teams and that’s the type of talent that wins you games and hopefully wins you silverware. At 32 he has experience in spades, he knows what it takes to claim championships and he is fully settled at the Dynamos having already spent a season with us last year. We all know what to expect with Juraj and, after years of suffering at his hands in the jersey of the Romford Raiders, I’m very pleased to have a player of his quality lining up for us once again”.